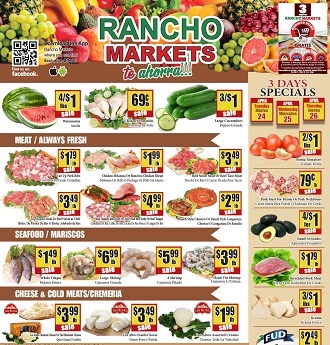 Here is the Rancho Markets Weekly Ad, valid April 16 – April 22, 2019. Save with this week Rancho Markets Ad Specials and bakery & deli deals & promotions. Shop and get low prices everyday on many items including red apples, chicken drumsticks, pineapples, evaporated milk, La Moderna assortment cookies, cooking oils, tortillas, Roma tomatoes, Fresh Jicama, Guava, FUD fresh cheese, Beef soup with rice, Chicken fajitas, Plantain banana, ginger, small muffins, and much more.